Junior infielder Alex Wright attempts to get Ericka Sadowski, SUNY Cortland sophomore utility player, out at first base during the Bombers' 8–1 win April 18. 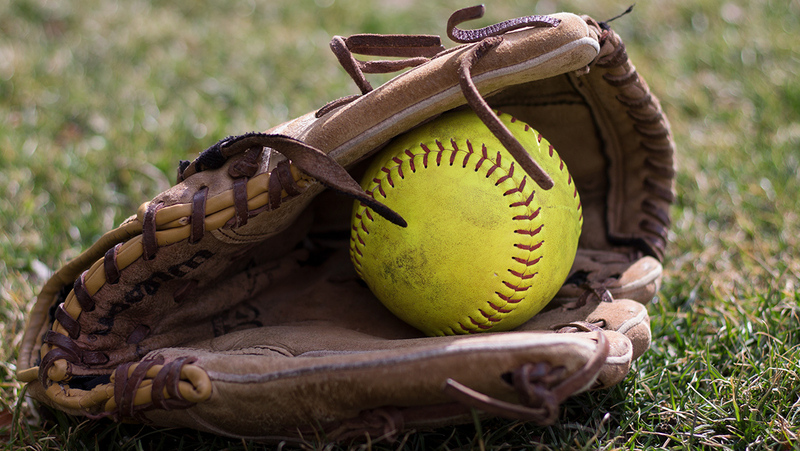 The Ithaca College softball team defeated SUNY Cortland in both games of a doubleheader at Kostrinsky Field on April 18. In the first matchup, the Bombers defeated the Red Dragons 3–1. The game was scoreless in the first three innings, but then junior infielder Ellie Murray kicked things off for the Blue and Gold in the fourth with a double to left field. The hit scored junior infielder Nikkey Skuraton to give the South Hill squad a 1–0 lead. The scoring continued in the fourth inning when junior outfielder Annie Cooney hit a double to right center, which caused Murray to score. The inning ended with the Bombers up 2–0. In the top of the fifth, the Red Dragons started to come back when senior shortstop Andrea Schoonmaker reached base on a throwing error and advanced to second. With the error, sophomore utility player Ericka Sadowski reached home to cut the lead to 2–1. In the bottom of the sixth, sophomore catcher Frankie-Ann McCauley hit a solo shot over the right field fence to score the final run of the game. Junior pitcher Haley Congdon pitched the complete game for the Bombers while only allowing one hit. Freshman infielder Gabby Laccona went 2–3 during the game, while Murray went 2–2. The Bombers capped off the doubleheader with an 8–1 victory. Getting things started for the Blue and Gold was junior infielder Hannah Anderson, who hit a grand slam in the first inning to jump out to a 4–0 lead. Cortland scored the first run of the game for the Red Dragons in the second, when junior first baseman Hannah Feldman hit a homerun to cut the lead to 4–1. However, the runs for the Bombers didn’t stop, as Cooney hit a single in the fourth to score junior catcher Alex Kimmel. Throughout the fifth was when the Bombers scored the rest of their runs. Anderson added another single on the day to score junior infielder Vanessa Brown to extend the lead to 6–1. Junior infielder Alex Wright grounded out to shortstop to score sophomore designated player Abby Shields. The final run of the game occurred when Murray grounded out to second base to score Anderson. Freshman pitcher Beth Flemming got the win for the Blue and Gold while only allowing three hits. Brown went 2–3 in the contest, while Anderson went 2–3 with five RBIs. The Blue and Gold are back in action against the University of Rochester for a doubleheader starting at 1 p.m. April 21 in Rochester, New York.